Thanks to The National Save the Sea Turtle Foundation (NSTSTF), sea turtles afflicted with a devastating tumor-causing disease now have a fast-track to recovery in Palm Beach County. 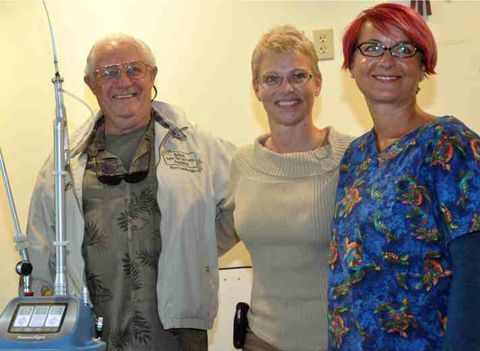 Recently, The National Save the Sea Turtle Foundation donated a state-of-the-art surgical laser machine to the Gumbo Limbo Nature Center (Boca Raton, Fl.) for use in their efforts to treat debilitated sea turtles. As the result of an ongoing partnership between Gumbo Limbo Nature Center and the Palm Beach Zoo (West Palm Beach, Fl. ), the laser will be housed at the Zoo’s Melvin J. and Claire Levine Animal Care Complex for use on both sea turtles and the Zoo’s larger animal collection. Among many global threats, Green Sea Turtles are particularly susceptible to a viral disease known as fibropapillomatosis (FP), which is evidenced by the growth of cauliflower-shaped tumors usually around the base of the flippers and the eyes, and also within the body where they can’t be seen and behave like cancer. When these tumors become grossly oversized, the turtles become unable to forage for food, and often succumb to starvation. Until recently only a few facilities in Florida were equipped to handle these turtles, primarily because of the risk of transmission to other non-diseased captive individuals. In response to the growing need on Florida’s SE Coast, the Gumbo Limbo Nature Center has developed a rehabilitation program that specializes in the treatment of turtles that are impacted by this disease. Surgical lasers have been long-recognized as remarkably effective for removing tumors from animals and humans alike, but until now this equipment wasn’t available in Gumbo Limbo’s medical toolbox. 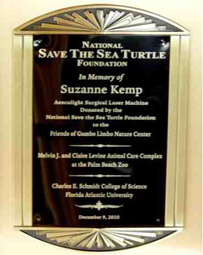 On December 9th, 2010, The National Save the Sea Turtle Foundation dedicated a brand new Aesculight surgical laser machine (Aesculight, LLC, Woodinville, WA) to the Palm Beach Zoo’s Animal Care Complex in the memory of Ms. Suzanne Kemp, a long-time supporter of sea turtle conservation. Mr. Mike Zewe of Gumbo Limbo led the ceremonies as Mr. Frank Wojcik, Executive Director of The National Save the Sea Turtle Foundation presented the laser machine and a plaque commemorating the gift and the partnership that has formed between these organizations. Dr. Michele Miller, Chief Veterinary Officer of the Palm Beach Zoo, welcomed all the participants and underscored the importance of local organizations working together toward common goals of wildlife conservation. Various representatives from these organizations and Florida Atlantic University’s Center for Sea Turtle Research were then treated to an informative demonstration by Aesculight’s Dr. David Bradley, who specializes in the medical applications of lasers. This gift marks a major step forward for Gumbo Limbo’s mission, and also serves as a valuable asset to the Palm Beach Zoo’s state-of-the-art veterinary hospital. 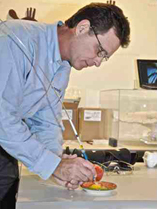 Dr. David Bradley demonstrates the operation of the Aesculight Surgical Laser machine. The recently finished operating room at the Levine Animal Care Complex, Palm Beach Zoo. 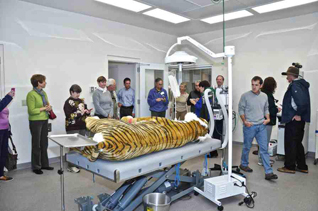 The tiger on the operating table is a stuffed replica. Attendees from the Gumbo Limbo Nature Complex. 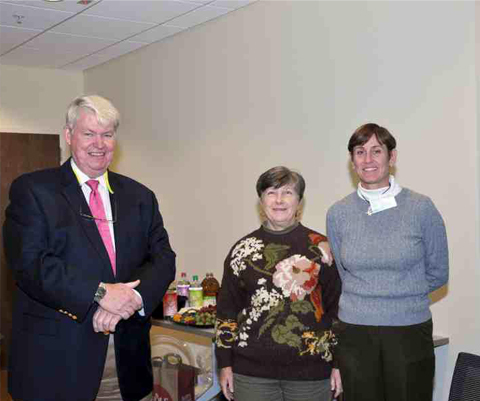 Left to Right: Dr. Kurt Rusenko, Stephanie Oulette and Sue Comoglio (Board Member, Friends of Gumbo Limbo). 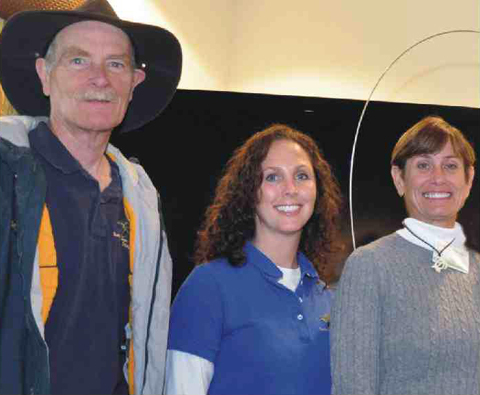 Left to Right: Frank Wojcik (National Save the Sea Turtle Foundation), Dr. Michele Miller (Chief Vet, Palm Beach Zoo) and Dr. Nancy Mettee (Chief Vet, Marinelife Center of Juno Beach). 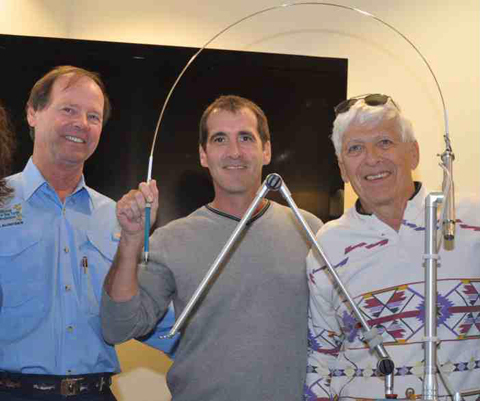 Left to Right: Wayne Kurian (National Save the Sea Turtle Foundation), Larry Wood (Palm Beach Zoo) and Mike Salmon (Professor of Biological Sciences, Florida Atlantic University). 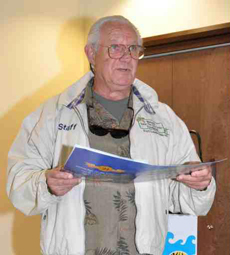 Frank Wojcik, President of The National Save the Sea Turtle Foundation speaking at the dedication. I would like to take this opportunity to announce our celebration of The National Save the Sea Turtle Foundation’s 24th Anniversary. We have been contributing to our community for that long, with help from people like Suzanne Kemp. One might ask who was Suzanne Kemp? Suzanne was an earth angel put here to conserve our environment and protect sea turtles, marine life and animals. She was called home early and left some of her earthly belongings of monetary value in trust to the Foundation to carry on. Today we are complying with her wish and giving on her behalf to the Gumbo Limbo Nature Center, the Palm Beach Zoo and Florida Atlantic University a state-of-the-art laser machine that indeed can save lives. We have with us today, Dr. David Bradley, who has volunteered his expertise, and will demonstrate and answer any questions about the Aesculight Laser Model 2010. He has also agreed to assist our qualified veterinarians and doctors in the performance of any operations upon request. Left to Right: Don Comerford (Member of the Board, Palm Beach Zoo), Diane Bilodeau (Business Manager, Gumbo Limbo Nature Complex) and Sue Comoglio.